Diane Franklin (born February 12, 1963) is an American actress. Before she got into acting, Franklin appeared in some TV commercials like Coca-Cola, Trident, Jell-O, and Maxwell House coffee, and also did some modeling work. She has worn a distinctive curly hairstyle throughout her career. Her first film role was in the 1982 film The Last American Virgin as Karen. 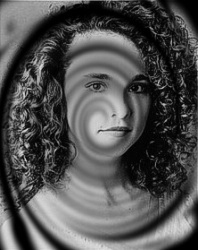 Diane Franklin's other well known roles in movies are in the 1982 horror film Amityville II: The Possession as Patricia Montelli; her most memorable role is in the 1985 comedy film Better Off Dead as Monique, the foreign exchange student from France. Franklin has appeared on some TV shows, some of which include Bay City Blues, Matlock, Freddy's Nightmares, and Providence. Franklin sang the National Anthem at Dodger Stadium on June 1, 2004, a nod to her Better Off Dead character's love of "ze Brooklyn Dod-zhers" and her desire to visit their stadium, which she fulfills at the end of the film.